Phil Scott isn’t only the Governor of Vermont, he’s also an avid short track racer in the same state. He runs semi-regularly at the Thunder Road International SpeedBowl in Quarry Hill, Barre, Vermont. In 2017, Scott ran 6 races at the .25-mile asphalt oval. The track is billed as the “Nation’s Site of Excitement” and Scott went to victory lane in 1 of those 6 events last year. It’s no secret that race fans support guns, Trump hats, a national anthem, prayer and American made brands. But, especially the gun part. It’s a right sided crowd. Scott is a republican himself but any gun-laws are sure to cause a storm with the very people that voted for him. And it has, as Scott was met with both cheers and boo’s at the Capital building as he announced that he signed the bill. The bill was passed Senate Legislature in March with a 17 to 13 vote in favor. – Raised the firearm age to 21. – Bump stocks ban (allows for faster firing). – Require all gun dealers to be licensed; Background checks for the gun purchaser (Military and police excluded as are exchanges of guns between family members). – Limited rifle magazines to 10 rounds. Phil Scott isn’t against guns, that’s not why the bill was signed. He’s owned guns his entire life. This bill is in relation to the countless mass-shootings across the country. “I want every student and every school, every mom and dad, every victim of violence in any form to know that today we stand together as we take steps towards making our community safer for all of us,” Scott said upon his announcement of the bill. A spokesperson for the Governor has contacted the race track directly. On the Governor’s behalf, they reached out to see if the track owners were worried about his presence at the speedway going forward. Track management has stated that they’ve received multiple calls and messages stating that the Governor shouldn’t be racing. You don’t have to go very far tp verify those claims. “We won’t be if the traitor governor is racing,” is just one example from the track’s comment section on Facebook. An entire facebook page has also been created against the Governor specifically noting his support of the gun bill. Phil Scott isn’t worried for his safety. He’s confident in the security team at the track. His concern is that his presence there would simply cause a scene that isn’t welcomed by the fans and drivers and essentially take away from the show at hand. As an avid short track fan myself, I’d argue that it wouldn’t take anything away. Yes, he would be boo’d. Every time he touched the track, in fact. But, that only makes things more exciting and adds to the show. Is it distracting from the show? Not at all. It makes it better. Currently, Scott is on the roster for 2018. The first race is scheduled for May 6, 2018 and will feature the ACT Late Model Tour. 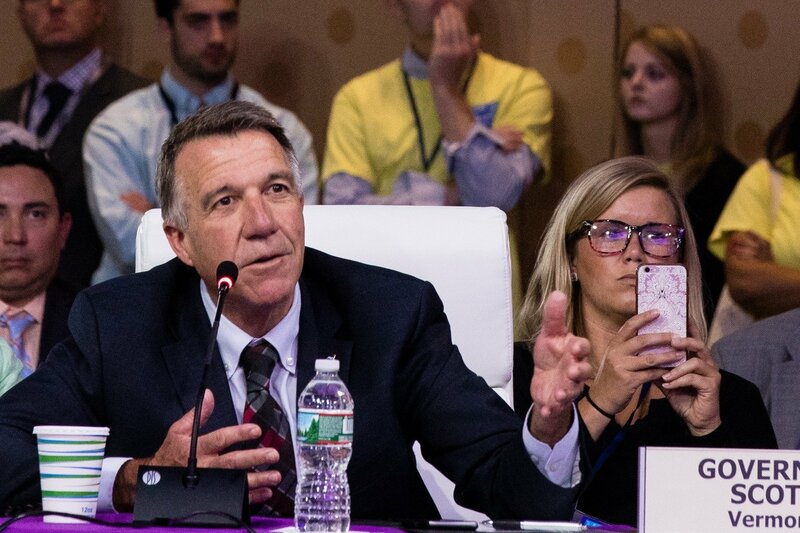 Phil Scott was elected the state Governor in 2016. He drives the #14VT late model which features sponsorship branding from the U.S. Military.